Life as the care provider of kids with unique medical challenges requires a great deal more juggling than most folks realize. In addition to all the typical worries about keeping kids safe, fed, reasonably clean, and educated, add in dietary concerns, care team management, IEP’s for educational progress, medication requirements, lots of paperwork and plenty of appointments. Keeping all the balls in the air requires a skillful act of juggling time and tasks that requires planning and practiced skill. Few of us are blessed with a natural knack for keeping everything in balance without a little extra help. Lay out, in writing, what tasks need to be accomplished. Then prioritize them. Don’t be afraid to let things that are truly unimportant fall to the bottom of the pile. Keep a tidy house, by all means, but don’t fret if the dust is transforming into a lively winter atop the bookshelf (barring, of course, a child with a dust allergen). Allow space for imperfection in nonessential areas to ensure the important tasks can be given full focus. Keep a daily master list of prioritized tasks. A yellow pad works great. Whatever doesn’t get accomplished just gets tacked on to the next day. Be aware of the time spent accomplishing tasks. Efficiency is critical to effective time management. Audit the time spent throughout the day and look for time sucking issues. This could be as simple as rearranging when tasks are done to bundle like with like or setting limits on activities that are non-productive and contributing to stress. 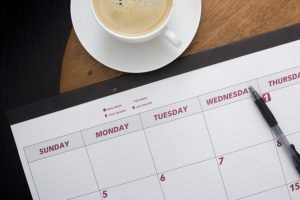 A small diary can help track changes in mood, behavior, and health so they can be discussed at upcoming appointments. Color coded appointment calendars can provide an instant visual of vital meetings versus things that can be postponed on challenging days. Create functional zones where all related items have a home. A carousel to manage all supplements, medicines, and related supplies. A basket to store old worksheets to provide practice work when a concept needs to be refreshed. A small filing cabinet to track all tax records and receipts. Having a home for these things can save time hunting down something vital. The idea behind this task management tool is flexibility and level of importance. Imagine a jar that must be filled with rocks, pebbles, and sand. If you pour in the sand first, the pebbles second, and the rocks last, you’d have a hard time fitting very many rocks in. If instead, you started with the rocks and worked your way through to the sand, you’d easily fit all the rocks, the pebbles, and very likely most of the sand. The big rocks represent the important tasks that MUST be accomplished. Schedule those. The smaller rocks are tasks that should be attended to soon, fit them in the day where you can. The sand is the stuff that you’d like to get done but isn’t vital. It goes where you find the time. By this method, you ensure the priorities are met and give yourself flexibility to survive chaotic days full of the unexpected. Time management can provide much needed stress relief for busy parents of disabled children. If you or a loved one are considering Pediatric Care Services in Aventura FL, contact the caring staff at Providence Healthcare Services. We provide services in all of Miami Dade county and the Upper Keys. Call today (305) 680-5349. Nercy Radcliffe, LHRM, is the founding President and C.E.O. of Providence Healthcare Services. She oversees all strategic growth initiatives of the organization while maintaining regulatory and fiscal responsibility.Nercy’s interest in home healthcare was sparked by her experience with aging grandparents that were cared for in vastly different manners, at home and in numerous post acute facilities.After fifteen years in successive management and marketing positions in the corporate environment she transitioned to the homecare industry and pledged to build a reputable organization committed to excellence and integrity in Miami Dade County. Nercy is a native of Miami, Florida and has resided here her entire life.She has a genuine love for the people, the culture, and the community of Miami. She serves on several healthcare committees and is actively involved in numerous business associations and health related organizations dedicated to advocacy, education, and improving the health and wellbeing of those in the community. Nercy is a Licensed Healthcare Risk Manager in the state of Florida. She holds a Bachelor of Business Administration in marketing from Florida International University and a Master of Business Administration from Liberty University.Nercy is an active member of the Homecare Association of Florida.